I need to exercise. It gets me out of my head. I think a lot. Given the chance I can stay inside my mind for days. Searching, analysing, recapping. I’m a storyteller. I tell myself the stories. When I run, swim or ride my bike, I don’t think. Just breathe. I spend a lot of time focussing on my breath. In. Out. In. Out. Jesus, am I breathing? Where’s my breath gone? Am I about to have a heart attack? There’s no time for scouring the depths of my mind. I’m too busy trying to stay alive. 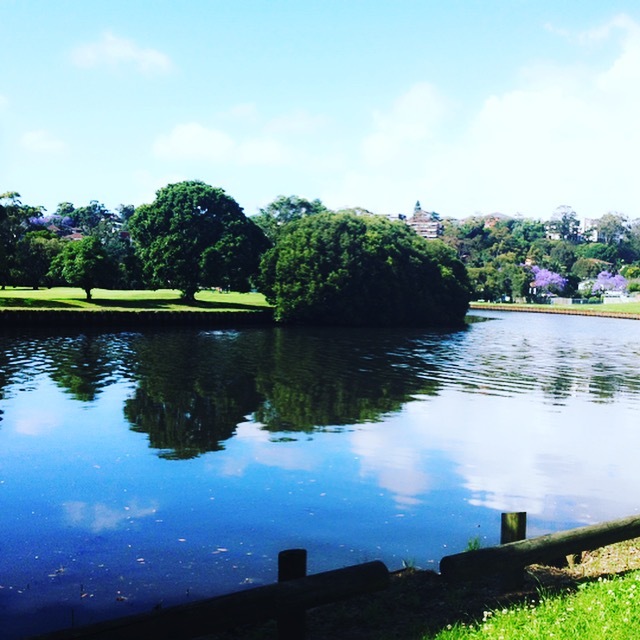 This morning I went for a run beside the Cooks River. It’s pretty. My boy had cricket practice. I used half the time to fit in a run. It was an opportunity. I took it. I was thinking as I ran about the ways I manage to incorporate exercise into my life. I’m pretty time-poor. A working mum, my life runs around a strict timeframe. There’s no time for the gym or yoga after work. There’s after-care pickup, homework, dinner, bath routine, collapsing. But I have to exercise. I have a lot of energy. Sometimes too much. It has to go somewhere, not inside me. My work is in Surry Hills. About 4.5km from Newtown. I bought a bike. I ride to work. About 20 minutes each way. Some days I run in. There are showers at work. One or two lunchtimes a week I go to Prince Alfred Park pool and swim laps. The beautiful stretch of blue water before me. Just me, movement, breath. It’s meditation. I can manage 20 laps in 30 minutes. I walk there, swim, shower and wash my hair. In an hour. It’s an effort. It makes me happy. Anyone could do it. They just have to want to. Commute? Get off a few stops before your stop and walk/jog in the rest of the way. Once you get fitter, get off a stop earlier. Make it a challenge. We all need a challenge. Have an hour break at work? Go to a gym close by, a run, a fast walk. Not every day. Just one or two. The afternoon feels better when you’re pumping endorphins. Book in for a running race or mini triathlon. Make it a goal. It will get you motivated. That’s what I used to do. I don’t need to anymore. I am motivated. Determined my arse will defy gravity. I’m driven. I want to be strong. I want to be fit. And I need that time. Even though it’s short. It’s time just for me. Time when I don’t have to think. Time when I can’t think. Time to breathe. I can’t imagine life without exercise. I have to do it nowadays, mostly for the focus and direction it gives my mind. It doesn’t so much stop thoughts. I’m not convinced you can ever not think or that you can ‘get out of’ your mind for that matter. Can the mind really have an ‘inside’ and an ‘outside’, a location at all? Of course, the general presumption is that thoughts reside in the head, while emotions reside in the heart, but the way I see it, they are both of the mind since nothing can exist outside the mind. Our whole world is seen and understood through the prism of our own minds. Heheh … probably getting a bit too philosophical for a Monday morn. Ultimately, I find exercise to be a wonderful way to redirect and focus my thoughts, and it can also help shift heavy emotions. It enables me to focus on the actions of my body rather than get caught up in that perpetual self-talk. The thoughts are still there, but now they have to contend with other thoughts, which includes many more thoughts about the breath, as you say. I seek exercise out now whenever I feel pent up – it (and music) are my daily salves. It's time. You know it. Your soul knows it. Your bank balance knows it.